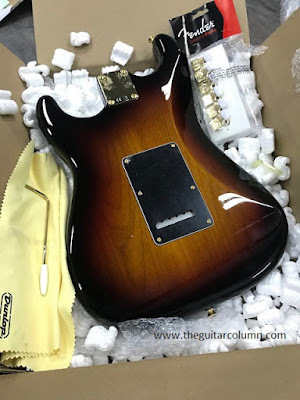 In Part 1 of our DIY Stevie Ray Vaughan strat build series, we detailed budding blues guitarist Shuen's choice of a quartersawn flamed maple guitar neck. After the first few coats of nitrocellulose lacquer were applied, the gorgeous figure of the flamed maple is finally starting to really show through. 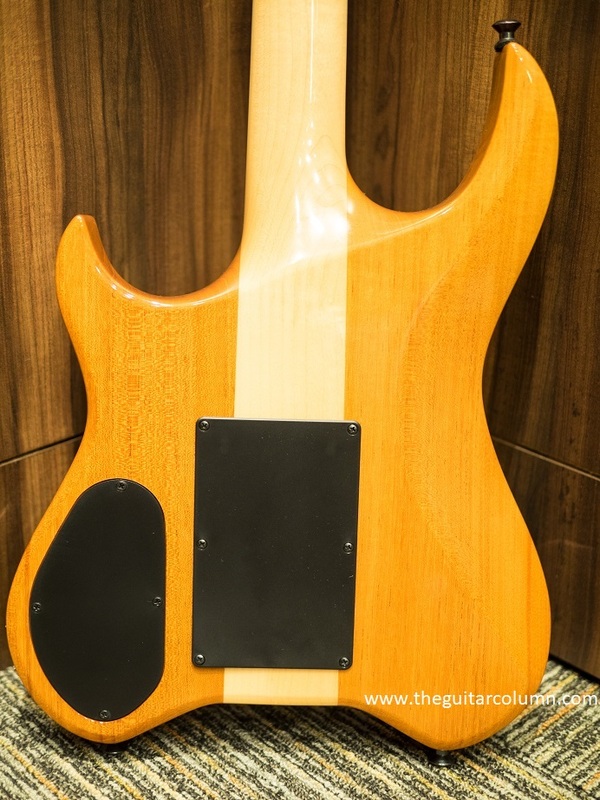 Nitrocellulose lacquer takes several days to dry between coats, and longer if humidity is high. While she waits for the neck to receive its final coats of lacquer, she could now turn her attention towards purchasing a guitar body. I don't know if she was being serious but Shuen initially indicated to me that she wanted to go with a cheap Squier body. 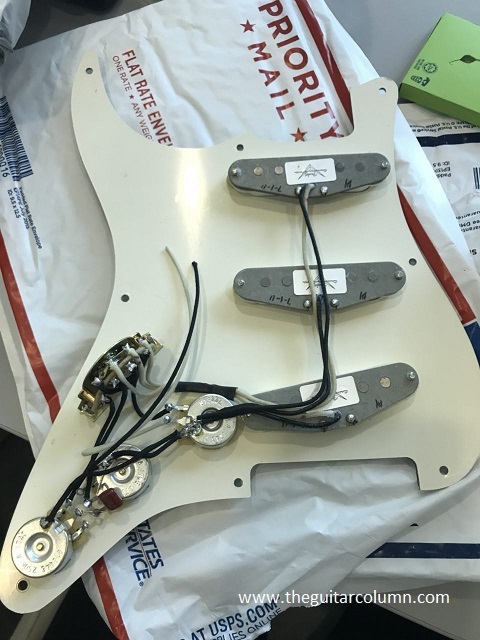 Which went against the grain -- pun intended -- of her original intent of getting the best possible after-market parts for her DIY SRV strat build. My reaction to that of course was why would she want to couple a beautiful 450 dollar quartersawn flamed maple neck with a glued-together-from-5-or-more-pieces-of-wood, el cheapo Squire Statocaster body? No offence meant to any Squire guitar owners out there. Your guitars rock. But only if it was made in Japan in the 1980s. After trawling eBay for a good fifteen minutes in between sets at my regular Saturday night gig, I suggested that she look into getting an actual Fender Stevie Ray Vaughan signature model guitar body . EBay seller The Stratosphere had a few nice ones on sale, loaded with Stevie Ray-approved lefty gold Fender bridge, neckplate, neck screws and backplate. After a few messages back and forth the next day, we both agreed on the one that had the nicest wood grain of the four, made from two pieces of alder and joined right down the middle. The good thing about guitars with finishes like the Fender 3-tone sunburst is that the grain of the wood is plainly visible and for this reason, guitar companies also typically save their better-looking woods for their guitars with transparent finishes. No ugly knots or unsightly grain -- those are reserved for solid colors. Dig that mellow 3-tone sunburst! Ebay seller The Stratosphere has an interesting business model. They seem to routinely take apart various models of Fender guitars -- even the Custom Shop ones -- and list the necks, bodies and hardware separately. Perhaps they move stock more quickly this way, rather than selling complete guitars. The Stratosphere shipped the SRV body via UPS. 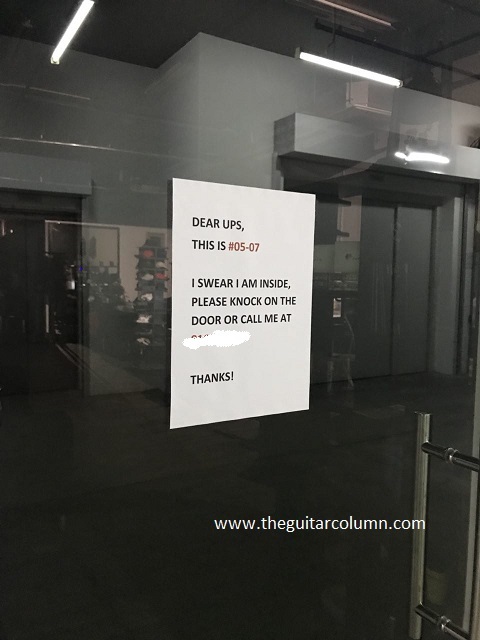 Now I don't know about the quality of service of UPS anywhere else in the world, but the service of their Singapore division leaves much to be desired. They seem to require more than one delivery attempt, which makes me wonder if the first delivery attempt was even made at all. Case in point, my own recent experience with UPS prompted me to advise Shuen to leave a clear notice outside her office door. In spite of the sign, she received an SMS message from UPS that a delivery was attempted but was unsuccessful since no one was there to sign off on the package. And since they had her cellphone number which was stated clearly on her door sign and the package, they could at least have called when attempting to deliver. 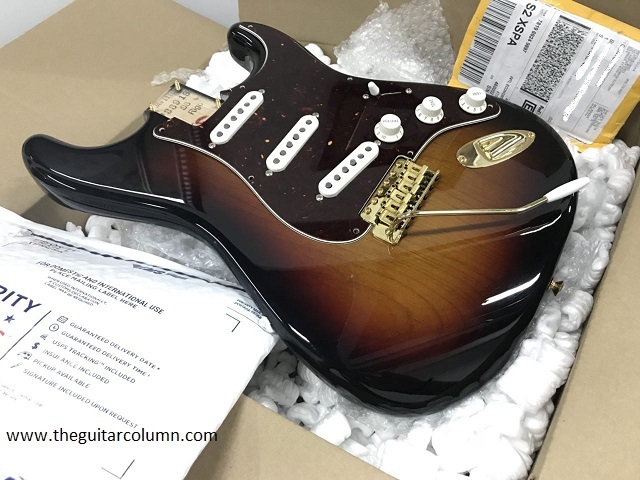 At any rate, after a phone call to UPS customer service in which she made her dissatisfaction clear, she received the package with the SRV body the next day. The phrase 'Hell hath no fury..' comes to mind. 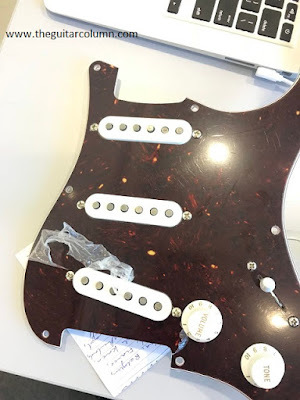 Shuen and I entered into a heated debate on the merits of purchasing a loaded pickguard versus obtaining the pickups, potentiometers, capacitor and 5-way switch separately and doing the soldering of the electronics ourselves. And by 'ourselves' I meant bringing it to a professional who could do it properly. Loaded pickguards, on the other hand, are off-the-shelf units that come complete with pickups and soldered electronics. The only soldering that needs to be done is the connection of the ground wire and the output jack. She decided, wisely I think, to go the loaded pickguard route. After another round of debates about pickup choices -- this one more testy than the first -- Shuen decided that the Fender Custom 69 pickups were the most pleasing to her musical sensibilities. And lo and behold, there was another seller on eBay, Twilight Guitars, offering a loaded pickguard with this very pickup configuration. 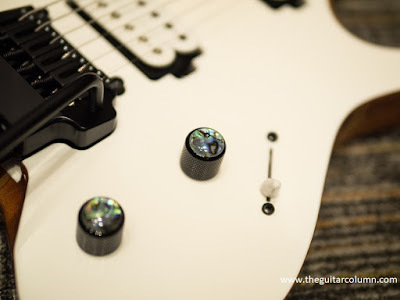 On her initial enquiry email, I suggested that she ask if they could do a simple wiring modification where the second tone knob controlled the bridge pickup. The conventional 3-knob Stratocaster wiring is master volume and two tone controls, one for the neck pickup and one for the middle. 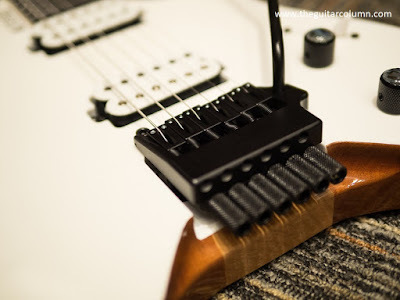 The shrill beast that is the bridge pickup is untamed by the tone controls and, in the wrong hands, has been known to blow audience's minds but not in a good way. She checked with the seller and they replied that they already include this mod as a standard feature on all their loaded pickguards. Awesome. 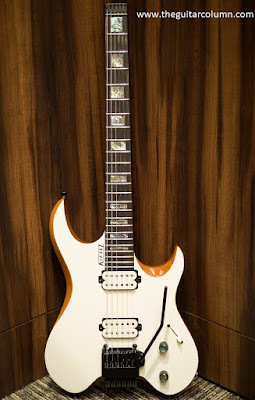 Shuen chose a tortoiseshell pickguard and white parchment pickup covers, knobs and switch tip which look stunning against the sunburst of the SRV body. Yep, it's all coming together very nicely. Stay tuned for Part 3 of Shuen's DIY Stevie Ray Vaughan Strat Build! A good buddy of mine, Shuen, recently mentioned that she wanted to put together a Stevie Ray Vaughan-style strat from after market parts. A capable guitarist steeped in the Texas blues tradition, she wanted to know what the best options were as far as neck and body woods, neck profiles, pickups, electronics and hardware. 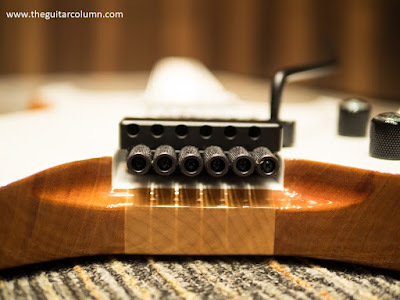 Having gone this route very recently with my Warmoth/MJT strat-style partscaster (an article on which will appear very soon), I felt I could give her the benefit of my experience as far as some of the potential pitfalls of assembling a DIY guitar. As well as the frustration she might encounter with a certain well-known courier company. But more on that later. My first reaction when Shuen told me that she wanted to get the best parts for her DIY build was why not just buy a regular Fender Stevie Ray Vaughan signature model Stratocaster. After all they were pretty common on the used market for 500 to 800 bucks below retail. Her response was an expletive-fueled rant about the shape and feel of the SRV necks from Fender. When the dust had settled and I had stopped blushing, I gathered that the stock SRV necks were too big and chunky for her relatively small hands. And the glossy polyurethane finishes on them were something she just couldn't jive with. I tried to steer her towards ordering a Warmoth roasted maple neck with stainless steel frets which I felt would give the best bang for her bucks. My own experience with Warmoth necks is that they require minimal fret dressing since their frets are already so meticulously installed and level. And she could choose the neck profile that best suited her, out of dozens of neck shapes. 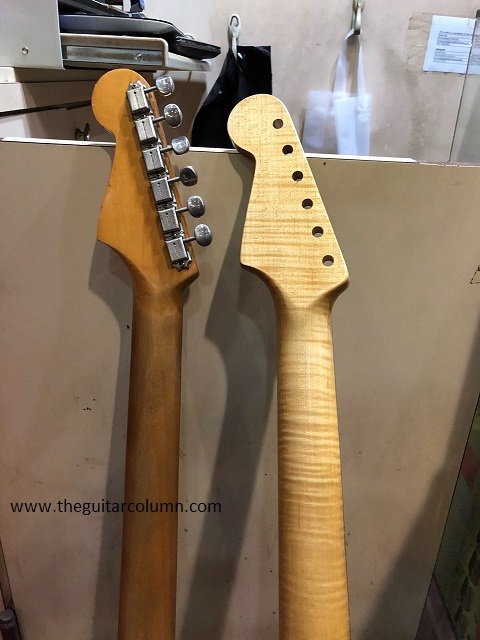 Roasted maple necks also do not require a hard finish, a plus since she liked the feel of raw wood so much, and the stainless steel frets were likely to last for a couple of decades before they were even worn enough to require a fret dress. 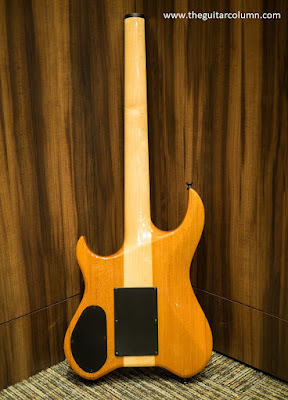 But of course, off she went shopping to Singapore's guitar haven, Peninsula Shopping Centre, in search of a new neck. What she purchased wasn't half bad, although pricey at 450 bucks. It wouldn't have been my personal choice but she chose a quartersawn flamed maple neck, with a rosewood fingerboard and medium jumbo frets. Quartersawn flamed maple is one of those rare wood types that one doesn't see very often, hence its higher price tag. Regular flame and quilt maple is commonly derived from flatsawn wood, so to see a combination of flame maple on quartersawn is only less rare than finding a pearl in a dinner plate of oysters, as far as guitar necks go. Even Warmoth charges a premium for it. But most importantly though, she felt the neck profile fit her hand perfectly. I recommended that she go with a gloss nitrocellulose finish for the headstock but a matte nitro finish for the back of the neck since she was averse to the sticky, tacky feel of a gloss finish. Nitro finishes I feel, allow for maximum resonance and are not as thick as polyurethane finishes which basically encapsulate the wood in a layer of plastic polymer. And as luck would have it, the same shop she bought the neck from also offered guitar finishing services in nitrocellulose. Nitro, I might add, is one of those hazardous materials that require a spray booth, full protective gear and a respirator mask when being applied. 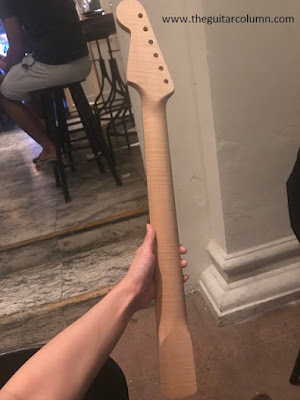 But about a week after sending in the neck for finishing, Shuen suddenly remembered that the edges around the headstock felt sharp to the touch -- a testimony to the accuracy of CNC machining technology, no doubt. Unlike polyurethane which covers quite thickly, the nitro finish would only yield a finished sharp edge. She called the store only to be told that they had already sprayed the initial coat. 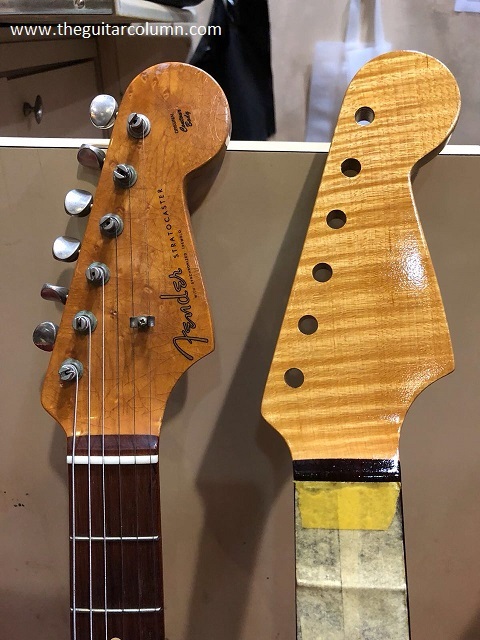 They didn't mind sanding over the sharp edges on the headstock but informed her that it would add another two weeks to the finishing process. The pictures of the partially finished neck they sent over as a teaser are nothing short of stunning! Nothing like glossy nitrocellulose lacquer to bring out the natural beauty of wood. Highly figured quartersawn flamed maple! It's been a long 4 months since I put in my order for my Kiesel Vader V6X, but it's finally here. I'm not sure what happened exactly, but the 4 months far exceeded Kiesel's stipulated 9 to 10 week build time. "This is the droid you've been searching for", quipped a buddy of mine, given that it's the week of the opening of Star Wars 'The Last Jedi'. I'm a pretty patient guy. I put in my confirmed order on August 10th but when November rolled around with absolutely no updates from Kiesel, I shot my sales representative an email on the 5th. And guess what? No reply. 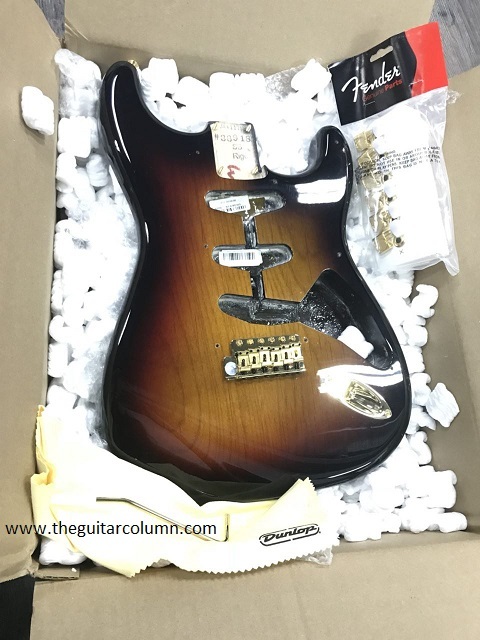 Another email on the 20th November and a Facebook message to another Kiesel rep, Chris Hong, finally got me a rough estimate on the completion date -- December 4th. Chris, I should mention has been stellar in bridging my email communications. My very first email enquiry went unanswered for two weeks until I contacted Chris. Sorry Kiesel, you guys make great guitars but I'm just telling it like it is. Interestingly, the build tag attached to the shipping carton states that the build for my Vader V6X started only on November 6th, a day after my email. The build tag accompanies every Kiesel guitar through each stage of construction from the very beginning. The build tag for my Vader also states 'Rush', which makes me think they might have overlooked my order. It also didn't help that a buddy of mine who had put in his Vader order a few days after mine received his guitar in October! But it's always exciting to see one's long-awaited guitar appear on the Kiesel Facebook page. In that one fleeting instance, everything is forgiven. The guitar arrived well-packed in the cardboard carton, softcase snug within. Kiesel ships exclusively via FedEx, so you can be pretty assured of reasonably careful handling and fast shipping. And did I mention that the flat rate of $27 that Kiesel charges applies to shipping anywhere within the US as well as anywhere else in the world? Pretty amazing, and kudos to Kiesel for that. I hope that doesn't change anytime soon. Amazingly, upon my initial inspection, the guitar was actually in tune when I took it out of the softcase with the exception of the low E which had flattened just a tad. A testament to the headless design no doubt. 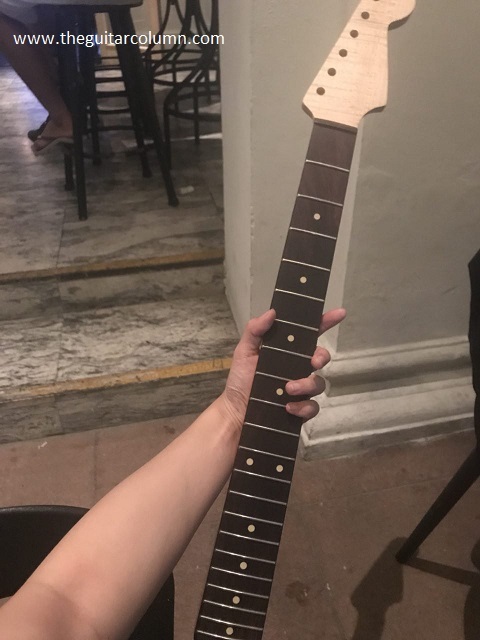 My Vader V6X came with a clean, flatsawn maple neck with no unsightly mineral marks -- those random brown streaks you sometimes see, even on high-end custom shop guitars. There was even a tiny bit of flame in the maple at the 6th fret. But that's wood for you -- we can never guess how it'll turn out after it's cut into shape, unless we have the luxury of handpicking the piece ourselves. 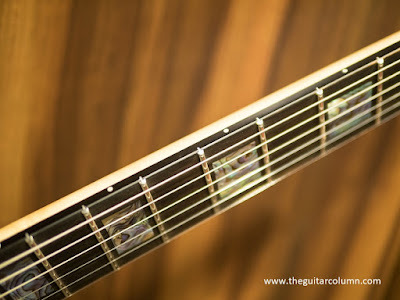 The fingerboard is made of a nice slab of ebony with meticulously inlaid jumbo stainless steel frets which are immaculately well-dressed and polished with smooth fret ends. The neck was set up with virtually no relief, which usually means buzzes at the first couple of frets, particularly on the low E string. Not so in this case. Kiesel obviously has certain construction methods in place that allow for extremely close tolerances. And with not a single Plek machine in sight. That, or whoever did the fret dressing on this Vader is a genius. The dual-action truss rod coupled with Kiesel's twin carbon fiber rods that run alongside make for a very stable neck. I've always felt that carbon fiber reinforced necks actually make the guitar sustain and ring a little better, making every note on the fingerboard sound absolutely even. Truss rod access, if the neck ever needs to be adjusted, is conveniently located at the top of the neck behind the nut. 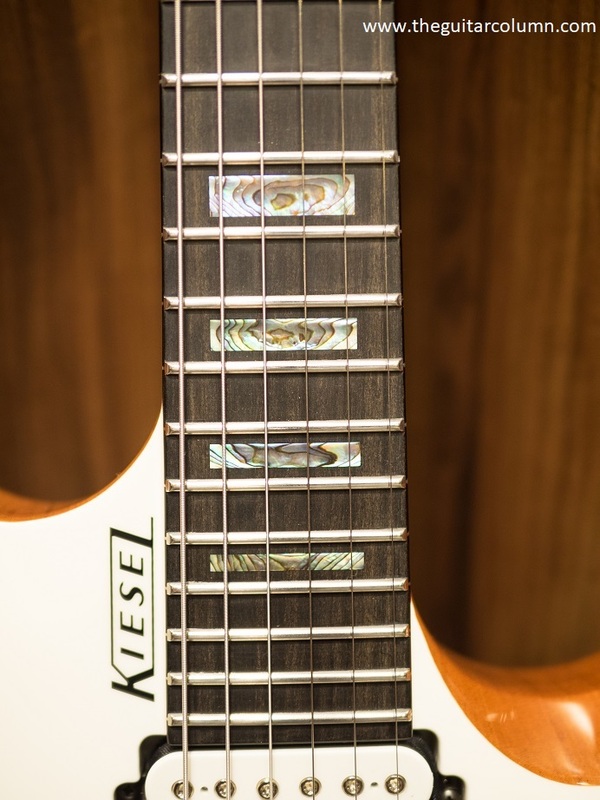 And those absolutely sublime abalone inlays! Where does Kiesel get stuff of this quality from? 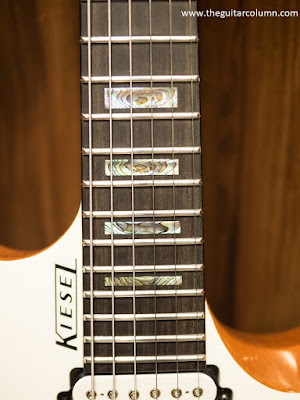 While browsing the Vader guitar galleries on the Kiesel site I noticed that the abalone inlays looked consistently amazing. I had to go for block inlays for maximum bling since the rest of the guitar is pretty plain. And I certainly wasn't disappointed. The blue, green and pink swirls are among the very best I've seen. And if you need help seeing the side dot position markers on dark stages, Kiesel's standard Luminlay dot markers glow very distinctly in low light. When I ordered this guitar with stainless steel jumbo frets and super-flat 20" radius, I thought it would take some getting used to. But surprisingly the flat profile is super comfortable. I prefer .009 to .042 strings for 25-1/2" scale Fender-style guitars and .010 to .046 for 24-3/4' Gibson scale. I figured that the slick stainless steel frets would enable me to bend strings effortlessly on the 25-1/2" scale Vader. The stainless steel frets coupled with the flat 20" radius makes for a string bender's dream. And given how long wearing stainless steel is, this guitar will never need a refret. Ever. On one of Kiesel's Q and A videos, someone once asked Jeff Kiesel what experience would be required to join the company as an employee building guitars. Surprisingly, Jeff said he would prefer someone with no experience in lutherie at all. In this way they can be trained according to Kiesel's methods without any interference of bias or opinion that an experienced luthier would have. If this guitar is any indicator of that philosophy, then it definitely works. This Vader V6X is a pretty simple build. I didn't want any kind of wood top glued to the body as I felt it would interfere with how the guitar resonated, particularly with a small-bodied instrument like this one. I also chose mahogany for the body wings, as mentioned in my previous article, as I wanted to take advantage of Kiesel's supply of Honduran mahogany. And I'm happy I did. The quality of the wood is outstanding, literally orange with straight close grain. I could be wrong, but I can't detect any resonance-dampening wood filler on the mahogany through the clear gloss finish. And this guitar resonates loudly unplugged! But because I chose to go for no top and a clear gloss back -- one of Kiesel's Option 50s, which is any specially requested feature not listed in the online Guitar Builder -- the guitar becomes non-returnable. Which was fine by me. The clear gloss back and sides also allowed the beautiful mahogany to show at the bevels at the front. The Vader V6X comes standard with a master volume and master tone and a 5-way selector switch. I chose the standard Lithium pickups although I was seriously considering the Holdsworths. The Holdsworth pickups were, oddly enough, not wax potted which to me meant greater potential for microphonic squeals at high volumes. I can't substantiate this as I've never tried them. The Lithium pickups supercede the old Carvin M22 pickups that were introduced in 1978. The M22s were designed by Jeff Kiesel's father, but the company has decided that the Lithiums are good enough for the M22s to be phased out entirely. The Lithiums strike me as a very versatile pickup, with an almost chameleonic nature. Depending on one's amp rig, pedals, and playing style, they cover everything from heavy metal, classic rock, stinging blues, to clean jazz with ease. One thing I noticed when researching the Lithiums by watching the many pickup demos on YouTube was how good the split-coil positions were. At my usual Monday night blues-rock gig I was able to coax credible single-coil SRV-type tones with the pickup selector switch in positions 2 and 4. According to the Kiesel site, when Allan Holdsworth was invited to test out the Hipshot/Kiesel tremolo bridge, he liked it so much that he asked the new bridge to be a standard feature on the Kiesel Holdsworth models. The Hipshot/Kiesel bridge is extremely responsive and sensitive. On my Vader, the trem effortlessly pulls up four frets to the note B on the G string and drops the strings absolutely slack on divebombs. String changes look simple enough -- something I haven't attempted yet -- although a Vader owner buddy of mine did warn me about over-tightening the Allen screws that hold the strings at the nut. He broke two brand new high E strings from torquing the screw too tightly. Overall, I'm very pleased with how this Vader V6X build turned out. The workmanship is truly impeccable and there is definitely a strong 'wow' factor the first time you open the case. 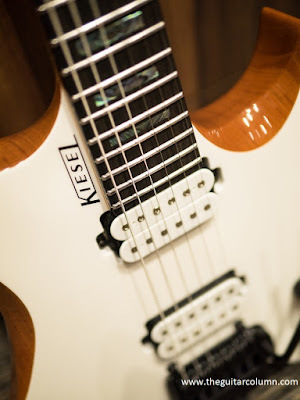 Kiesel offers a 10-day return policy on all their non-Option 50 guitars and you can tell that they want to take your breath away at first sight of your new guitar. 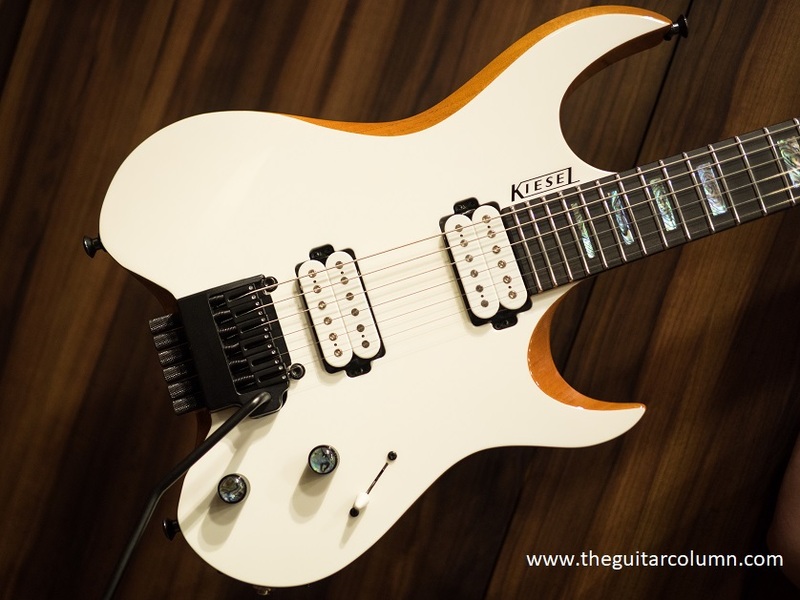 But Kiesel could improve on their email communications and follow-up on reasonable enquiries such as, "It's been 4 months since I placed my order. Any idea when my guitar will be ready?" But we can't be absolutely perfect in everything can we?